This week in the Torah, we will read the story of Noah. Most days of late, the October sky has been pouring down rain and even snow upon us. Pretty apropos for the parasha (Torah portion), but not the best weather for a wobbly walker...nor the optimal light for viewing the resplendent beauty of the New Hampshire foliage. Yesterday...there was a break in the clouds and I took some small steps (with the aide of my trusty cane) into my yard. Next week's Torah portion is Lech Lecha..."go forth" or "go to yourself", depending on how you translate it. So these small steps were perhaps a foreshadowing of that continuous journey. Up against the side of our house I found my favorite autumn painted bush ...it is called a "Burning Bush"(yes another biblical reference). 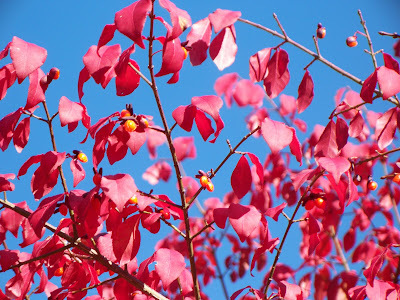 The scarlet leaves against the azure sky created a sight miraculous enough for me to stop, take a breath and pay attention; awed by God's Presence clearly illuminated in the magnificence of this yearly phenomenon. I am so grateful to have been granted the strength, balance and sunshine to witness this maravel up close again this year. 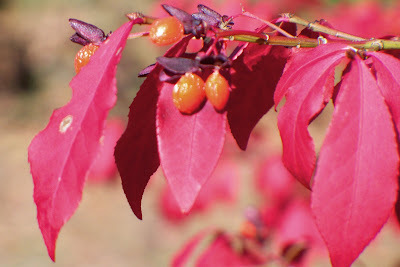 On top of all that there were the flame colored berries! Small but abundant gifts of nourishment for birds migrating south as the winter chill begins gaining ground each day, and sustainance for those woodland creatures whose evolutionary fate is to remain here through the long, harsh winter. One short walk allowed me to witness everyday miracles that I would have surely missed if I had not been blessed with my unsteady gait, if I had been walking more quickly, if I had not been paying attention, if I had not stopped to look, take a deep breath, to allow awe to fill me. You don't have to be slowed down by illness to find a moment to be still and experience awe. A 10 minute walk or roll (if you need a wheelchair) through your yard, neighborhood or a nearby park is all it takes to wake up your senses and open your heart to wonder. What timely, wise, wonderful post. So often I think I must have huge expanses of time to meditate, pray or get out in nature to plug into God. You remind me how little effort is really required to just get present with ourselves, our world, and the divine. I celebrate your wisdom. Thank you! p.s. And though I am not Jewish, I LOVE how you share your spiritual journey with us through that lens. What a gift and one I feel privileged to receive. Hugs! I'm glad this reminded you of how simple it really is to find Divinity right in front us if we just pay attention and how little of our precious time (and it is precious) it takes to experience that connection. I'm happy too that sharing my Jewish lens is not off-putting for you but an invitation to see the world reflected off a different facet of the same sparkling crystal some call God, some call nature, spirit, universal energy...I love that about your blog and others that I follow as well. It's heart opening to allow ourselves to glimpse our experiences through the eyes and language of others. There is a gift in the most unexpected circumstances sometimes. Being made to slow down and take greater care of one's movements opens up new ways of seeing. Getting down on the ground with a baby and maybe crawling with them gives us an entirely different perspective, for instance. Using a cane or wheelchair allows us a different viewpoint. Oh, that Burning Bush is glorious! I'm so glad you took the pics and shared them with us. I love garden pics, things that God made growing unhurriedly, with no worries, no thoughts of past or future, utterly content to simply be. I'll also echo Jan's gratefulness for your Jewish lens. I believe God reveals himself/herself/itself in whatever manner is best for each individual, even though we are all one. I look forward to learning more about your faith practices, Laura. Thank you Rose...where we sit, where we stand, where we lay down...it can change our outlook on life in a heartbeat. 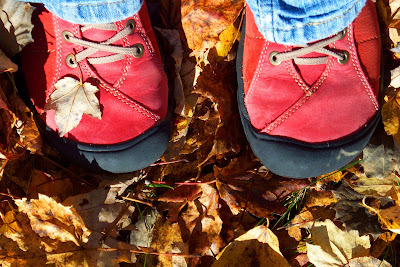 Taking the time to imagine what the view is like standing in someone elses red or brown, black or blue shoes, their comfy chair or the hard earth they are resting upon can open us to the truth of our unity. Did you know we share the same name? My middle name is Rose...and my younger daughter is Rosewillow. We are kindred spirits in so many ways! I love the pictures and message of this post. My mother passed away from a very rare kind of cancer. I was her caregiver from the time of her diagnosis until she passed away which was 6 months later. As a result, it made me realize how so many things we take for granted our truly blessings and miracles. The pictures that you shared along with the joys of being able to go outside are such great reminders of the beauty that surrounds us all if we just really look. I'm hope that my words and images reawakened sweet memories for you along with the sadness of missing your mother. What a gift for both you and your mother to have spent those last 6 months together. I'm sure it was painful for both of you at times, but still a gift. I was so saddened when I read your comment on my blog. Not that you left a comment, of course, but that it was how I found out that you have been so ill. I didn't know and I apologize for it taking me so long to find out. In so many ways, blogging has rescued me from the loneliness of chronic illness. It can be such an incredible lifeline in times of physical weakness and I am glad to know that you have discovered that. Keep your heart and your soul open to all of the wonderful friendships that you can make in the land of blogs. To me, blogging has been just another gift which has been bestowed upon my life. I am holding you close in my thoughts and prayers. May the One who gives us life, restore you in body, mind and spirit. Blogging does feel like a lifeline many days when I am alone in the house. It is a way for me to connect with other people in a profoundly deep way. It is also a healing practice that allows me to fully feel the blessings in my life and express gratitude for all of the goodness that HaShem has created not just for me, but for all of us. Thank you for holding me in your thoughts and prayers, I will hold a prayer for you gently in my heart as well. Thanks o mysterious "M"...I'm not surprised that it would touch your wise and wide open heart, old friend.